When I read Paul Starobin’s recent article “Why Russia’s Post-Putin Future May Not Be Democratic”, I couldn’t help but disagree with his skeptical assessment of the political inclinations of the Russian people. Indeed, having just recently returned from that country, where I was working as a long-term elections observer for the Organization for Security and Cooperation in Europe (OSCE), I can attest that Russians are far more interested in liberal democracy than Mr. Starobin suggests. Mr. Starobin’s mistaken conclusions are derived from a common mistake: In using the Russian election results as the basis of his analysis, he takes them at face value. The OSCE has already detailed the many problems we found in the elections process. An election is supposed to represent the political will of a public that has been fully exposed to the views of differing political factions. By that measure, the Russian elections fell far short. The most important statistic to look at in assessing the legitimacy of an election is the turn-out figure. Officially, 60 percent of eligible Russians turned out to vote. I personally believe that there is good reason to be skeptical of that number, but even if it’s accurate, that means that at least 40 percent of the voters stayed home in spite of constant exhortations from the government to exercise their sacred duty as citizens to vote. Why were so many Russians so unenthusiastic about voting? My observations suggest only one answer: Voters didn't like their choices. Many people told me that they hated the ruling United Russia, which they viewed as corrupt. But they disliked the Communist party even more, and, meanwhile, parties like Just Russia were viewed as nothing more than arms of United Russia. There was a campaign to encourage people to vote for the Communists as a protest against United Russia. But many more people voted by not voting at all. Still others submitted unmarked ballots, which were tallied as spoiled and never counted. 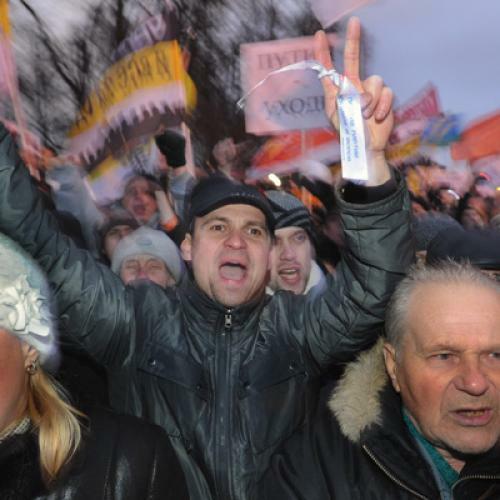 Mr. Starobin also points to the weak support for Russia’s liberal party, Yabloko. Isn't their miniscule vote proof that “western liberalism” has no appeal in Russia? No, not really. That is like saying a boxer's failure to knock-out his opponent with one arm tied behind his back is proof that he can't box. On the surface, Yabloko appears to be a normal political party, one free to compete for power: After all, they have advertisements all over the place, on billboards, on television, and on the sides of buses. But from my conversations with people in Russia, I learned that Yabloko is burdened by constant harassment. Indeed, its supporters take real risks in backing the party. This may explain why you will never find a Yabloko poster in a store or kiosk window (or any party's besides United Russia for that matter). One interlocutor told me that Yabloko is left alone when it is doing poorly in the polls, but that trouble begins once it starts to gain in popularity. Needless to say, the party has difficulty raising money under these circumstances. (For proof of that, one need only compare Yabloko's simple TV ads with United Russia's professionally-produced commercials.) Furthermore, under Russian elections law the votes of parties that fail to cross the 7 percent threshold are automatically given to the party that finishes first in the voting. Given that there were rumors that Yabloko wasn't going to make the 7 percent mark, many Russians calculated that a vote Yabloko was liable to become a vote for United Russia. Some observers of Russian politics suspect that the Kremlin allows Yabloko to survive as a weak party precisely so that it can cite it as "proof" of the Russian people's lack of interest in "western democracy." Interestingly, about a third of Russian nationals living in the U.S. voted for Yabloko, which I think is some indication of how well Yabloko would do under less constrained circumstances. Furthermore, who says an opposition leader or party is needed in order to bring about democratic change? The Arab Spring in Tunisia and Egypt was not led by an “opposition leader.” They were led by ordinary citizens organizing online and taking to the streets. Similar things are happening now in Russia. Many of the demonstrators in Moscow last weekend did not belong to an organized party or movement. They were just ticked-off citizens who decided on their own to turn-out. Given how tech savvy Russia has become, I wouldn't be surprised to see more of that. Another factor in these elections that Mr. Starobin does not account for are the laws governing political debate. In Russia, it is illegal to criticize one's electoral opponent. Americans bombarded with negative campaigning may think that sounds appealing, but they should think twice. The upshot of the law is that the incumbent ruling party as well as parties with extreme political views have a structural advantage. Since they are essentially immune from criticism, they can say whatever they want, no matter how crudely populist or blatantly untrue, without fear of being called out. Voters in general and impressionable young voters in particular are thus not forced to think too hard about what exactly it is that they are supporting. Mr. Starobin also trots out the very tired cliché about how Russians were supposedly turned-off to democracy in the 1990s. This is a claim repeated so often by the Kremlin and its defenders that people seem to assume that it is true, but I’ve never seen evidence for it. I don't doubt that the Russian public wanted greater order in the 1990s, but when did they ever express their wish that the entire democratic process be ditched? I don't recall the Russian public being consulted on such things. Moreover, young Russians today were small children in the 1990s and are far more focused on the future than the past. The Kremlin is not going to be able to keep singing its song about the chaotic 1990s much longer. Russians are quickly getting tired of it. Finally, Mr. Starobin resorts to what I refer to as “cultural determinism,” which is a popular sport where Russia is concerned. He’s not the first to suggest that Russians just aren't culturally capable of sustaining a democracy. But, historically, this is a claim that’s also been made of many other nations—from the Spanish and Italians to Latin Americans to Africans to Koreans and Japanese—that we now accept as naturally democratic. The fact is that the Russia of today is not the Russia of the czars and commissars. If you step into any Russian café you will see young people glued to their laptops and iPads; even in small rundown cities you can see billboards advertising tourist destinations like Thailand, Turkey, and Israel. Can anyone have imagined in Soviet days that provincial Russians would be taking beach trips to Israel? The fact is that Russians are more comfortable dealing with foreigners and more knowledgeable about the world than they used to be. This is why the Kremlin's more recent attempts to stir up anti-Western sentiment are falling flat: more and more Russians are coming to see themselves as part of the West. Russians are also more self-aware about the weaknesses of their own society: There is even a serious public discussion taking place about curbing sales of alcohol and tobacco. I do agree with Mr. Starobin that the gains made by the Communists and the far-right LDPR are a cause for concern. However, I don't think that they are an indication that Russians are not interested in democracy. What they are is an indication that the Kremlin's political machinations have completely backfired. The Kremlin thought that they could control the Communists and the LDPR while shutting-out democratic opposition (who, weirdly, they brand as “extremists”). It is a strategy that has mostly been to the benefit of the Communists and the LDPR, spurring alarmed Russians to take to the streets. Emigration is also no longer the effective safety valve it once was: An increasing number of middle class Russians are asking why they should have to leave Russia to fulfill their goals is life. The Kremlin itself seems to be realizing that its strategy is crumbling. In an interview this week Putin's political strategist Vladislav Surkov spoke of the need for a political party for what he called “irritated urban communities”. The Kremlin is now acting the part of a teenage boy that is coming to realize that he has been hanging out with the wrong crowd. Does he continue to align himself with radical parties and pray that they play nice with him, or does he make new friends? Russia’s liberals may no longer be interested in playing nice. Prominent political figures, like billionaire Mikhail Prokhorov and former Finance Minister Alexei Kudrin, are now actively challenging the status quo. Prokhorov has already announced he is running against Putin. Kudrin, who is a very popular figure both in Russia and abroad is forming a new party. Kudrin is especially difficult for the Kremlin because he is a mentor of Putin’s, not an oligarch who can be attacked as a criminal in the pay of westerners. In my opinion, Prokhorov and Kudrin are the faces that are more likely to represent Russia’s political future. In short, I think there are plenty of reasons to be hopeful about the prospects for a true Russian democracy. But I will readily admit that neither I nor Mr. Starobin can say for sure. That is the problem with holding flawed elections. The results don't really tell you all that is going on. Mitchell Polman has participated in ten OSCE elections observation missions. His views are strictly his own and do not represent those of the OSCE mission as a whole.